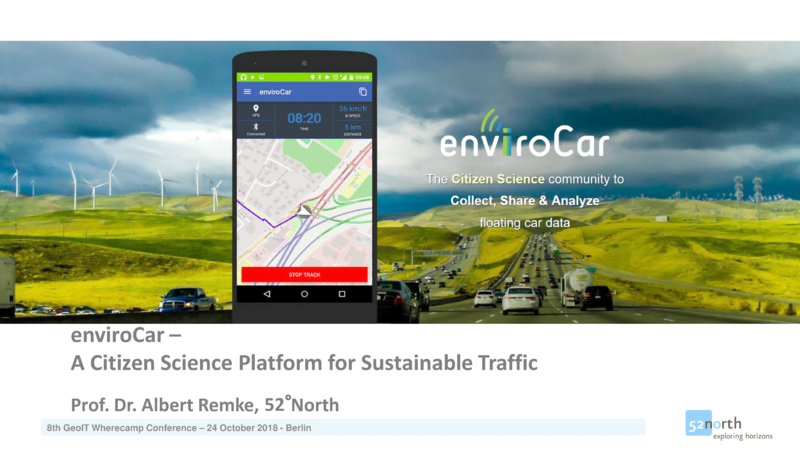 enviroCar is an open platform for collecting and analyzing car driven tracks. The collected tracks consist of GPS positions enriched with additional sensor information by utilizing the vehicle’s inertial diagnostic capabilities. Based on the sensor information, fuel consumption and CO2 emissions are estimated for petrol cars. Users have full control on their collected tracks and can share them in an anonymized fashion via an open API. Various analysis tools support the exploration of the data, e.g. in map-based views or time-series charts. In this talk, we first provide an overview on the enviroCar platform. Afterwards, we present results from previous projects using enviroCar including an evaluation of traffic lights along major roads in Mönchengladbach. Finally, we illustrate current research challenges by introducing the CITRAM project, a project funded by the German Federal Ministry of Transport and Digital Infrastructure.